Previously in French, 16th-century black morocco; rebound in red morocco by Marguerite Duprez Lahey in 1951. Written for the Augustinian house of Saint-Victor, Paris; Didier Petit Collection at Lyon (Catalogue, 1843, no. 352); Howell Wills sale (London, 1894, no. 1159) to Pickering for Richard Bennett; Catalogue of manuscripts and early printed books from the libraries of William Morris, Richard Bennett, Bertram, fourth Earl of Ashburnham, and other sources, no. 11; purchased by J. Pierpont Morgan (1837-1913) with the Bennett Collection in 1902; J.P. Morgan (1867-1943). 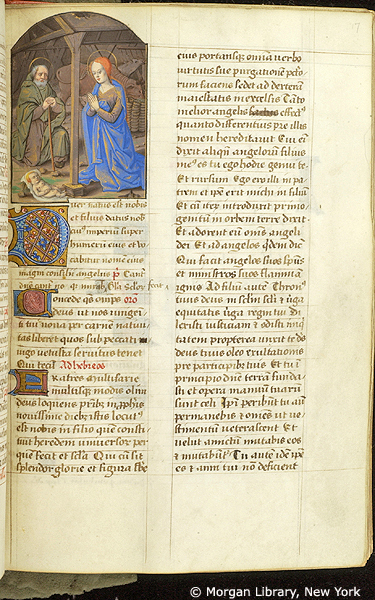 Ms. missal with a calendar for the Augustinian house of Saint-Victor, Paris; written and illuminated in Paris, France, ca. 1500. Decoration: 1 large and 4 small miniatures, 13 historiated initials.